Ethical living and spiritual living are linked; they both connect the believer to the world beyond himself or herself. The spiritual connects one to God, and the ethical deals with how one lives with others. Thessalonians 5:17 says to pray continually. Structured prayer is difficult for many of us, but we can still cultivate a spirit of continual prayer — simply praying as we go about our daily activities. When a person “practices the presence of God,” to quote Brother Lawrence, it is as if God becomes a friend, a companion who goes with you to all places and through all moments. A cynic could say that we are only silently conversing with ourselves. Maybe so, but this internal friend often challenges us, calls us up abruptly from selfish, prideful, greedy, lustful and hurtful thoughts and behavior. This friend never brings us down; this friend calls us to something higher. This friend seems to bring something from beyond oneself into oneself. “The Word of God is alive,” says a Casting Crowns song, “and it cuts like a sword through the darkness with a message of life to the hopeless . . . bringing life to all who believe.” The song is speaking of the written Word — the Bible. I think of it more broadly, as the Word referring to Jesus and to the His Spirit within each of us. God’s Spirit is alive inside the believer. This Spirit cuts through the darkness of the world even though not completely dispersing the night of evil, sin, pain and hurt. The Spirit brings hope to the hopeless, and we are all hopeless at times. The Spirit brings life, and we all feel spiritually, mentally and emotionally dead at times. Life wins when it is invested with love — love that flows from God to us and from us to each other. There is a great deal of talk about spirituality in today’s North American culture. 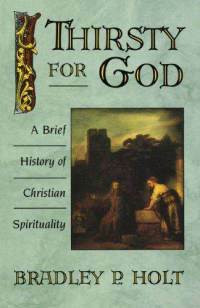 Much of it is associated with what typically are called Eastern or New Age forms of religious expression, but Bradley P. Holt, in his book, Thirsty for God: A Brief History of Christian Spirituality, shows that spirituality has been part of Christian theology and practice since the very earliest days of the faith. It also was part of the church’s first great global expansion after the death of Jesus, its contraction to Europe and Western culture, and now its worldwide spread again. Christianity is a religion with a rich spiritual heritage, and Holt offers a roadmap of sorts to begin understanding that heritage. Holt sets out to “survey the variety of Christian spirituality in both space and time.” The story of Christian spirituality covers two millennia and five continents. It deals with both the inner life and the connection of that inner life with how one lives in the world, and the survey tracks closely with the theological issues of particular times and places. The author also states on page 12 that his aim is to “bring together two fields of knowledge that do not often connect”—the history of European Christian spirituality and the study of missions and new indigenous movements. “Spirituality” is a word used across varied religions, but Holt deals with Christian spirituality, which he describes as both a “particular style” of discipleship and a “style of walking in the Holy Spirit. “It therefore involves the whole of life, not some private segment. It is our relationship with God, ourselves, others, and the creation.” Christian spirituality should keep those four relationships in balance, but much of church history has “focused on God and others, distorting the relationships to self and creation.” These four relationships provide a backdrop for the entire book. There are both theological and practical norms, the author says. He comes closest to stating theological norms on page 127 when he says he expects an “authentic theology to reflect the Scriptures; to give a central role for Jesus as the Christ; to value faith, hope, and love; to be understandable within its culture; and to challenge the idols of that culture.” Practical norms have to do with how helpful a practice is in a given situation. The book is structured in eight chapters. Between introductory and concluding chapters, the author essentially progresses through Christian history, beginning with the Bible and then moving to an initial global stage before focusing on Europe and North America before a twentieth century chapter that includes spiritualities associated with other continents. Holt definitely achieves his purpose of providing an introduction to Christian spirituality by giving brief glimpses of many theological and practical movements and the key practitioners in those movements. The names associated with Christian spirituality in the early church and Europe, North Africa, and the Middle East are all here—Tertullian, Origen, Antony, Augustine, Benedict, Bernard of Clairvaux, Francis of Assisi, Meister Eckhart, Julian of Norwich, Thomas a Kempis, and George Fox, to name but a few. And he adds to that list some names that will not be as familiar to a North American audience—Gustavo Gutierrez, Kosuke Koyama, and others. The names of all of the many spiritual leaders he sites are listed in a helpful “Time Line” appendix. The list includes the names of more obscure personalities from the West and some well known figures who are generally thought of as great theologians. The author goes back to the New Testament to provide his own theological connection to spirituality. “Whatever else the Bible says about God this is relevant for spirituality, this is fundamental. God is to be loved with the whole self,” Holt says on page 17. Then, he adds, “Spirituality is welcoming this love into our lives; allowing it to change our habits, feelings, and thoughts; and thus returning the love to God who started it.” While Thirsty for God is primarily a survey of Christian history, connections such as this by Holt make the book helpful for the believer who desires to connect right theology with right spiritual practice. Christians in the West typically think of spirituality as dealing with the interior life of prayer, meditation, contemplation, and possibly worship. Holt deals with those aspects of spirituality, but he also is persistent in connecting these spiritual experiences with outward expressions of Christian love and activity in the culture. “It is important not to separate ethics from spirituality, lest spirituality be a private escape from the real world, a self-fulfillment at the cost of others,” he says on page 20 in his discussion of spirituality in the New Testament. “Ethics and spirituality belong together.” It would be hard, however, to support this connection in looking at some of the great spiritual leaders of the past who withdrew from their cultural context, for instance with the desert fathers, but many others definitely made the connection, such as Francis of Assisi. Origen actually coupled the ethical, theological, and spiritual, Holt says on page 36. Origen set forth three-stages of the Christian life—moral, natural, and contemplative. The first has to do with behavior, the second with the intellect, and the third with spiritual union with God. These are helpful connections for the Christian context of North America today because it provides a balanced, holistic means of seeking to understand the Christian life. It also can break down some of the fears of and resistance to spirituality when it is simply seen as otherworldly experience often associated only with Eastern religions such as Hinduism and Buddhism. The ethical component connects to another of Holt’s emphases—the relationship of spirituality and Christian living to culture. “This book asserts that it is possible to be authentically Christian in any culture,” he said on page 96. “There will indeed be tension between Christianity and any culture …, but there will also be gifts that every culture can bring to the understanding of Christianity. …” Holt illustrates this in relation to the early years of Christian globalization on page 49 when he says, “Christianity in the early centuries developed in a number of cultures and was expressed somewhat differently in each of them. The foundational developments occurred not only in Greek and Latin contexts, but in Syriac and other lesser-known contexts.” This has happened in more recent decades as the churches in Africa and Asia have slipped the bonds of European Christianity with the passing of colonialism. This is a fundamentally important subtext to Holt’s book—that other cultures have much to offer in understanding Christian spirituality. The reason this is important is because of the Enlightenment’s impact on Western thought in general and Western Christianity in particular. Holt is convinced that the Enlightenment is what separates the West from the rest of the world. (84) “Missionaries from the North Atlantic countries generally taught Christianity on the basis of their own post-Enlightenment, modern assumptions and addressed their answers to the kinds of questions they were accustomed to at home,” Holt says on page 109. “Christianity became a classroom religion of many people. It taught reading and writing and the correct answers to the question in the catechism, … but it often did not address the questions Africans raised.” He probably would say the same thing about questions raised in Latin America and Asia. Understanding such differences offers a way forward as East and West, North and South are more frequently being brought into contact with one another. The potential for a more fully orbed understanding of the spiritual life and Christianity in general is made possible by these coming together of cultures. The potential benefits of this can be illustrated by some speculation. Metaphors of light are often used to speak of God and spiritual understanding. There are related metaphors that speak of cleansed souls being made white as snow. There is nothing wrong with these metaphors, and they have often been seen as very helpful by Caucasians. On the other hand, darkness is often associated with evil. There is nothing wrong with such metaphors, but what impact does such imagery have on darker-skinned persons? Then, in Thirsty for God, the reader encounters a European mystic, John of the Cross, who uses the “dark night” as a metaphor to “describe the inability of the intellect to grasp God and to describe the experience of the soul on its journey to the mountaintop, to union with God.” Suddenly, the light-skinned person is jarred with a new way of seeing darkness, and the dark-skinned person is brightened with a positive image relating darkness to intimacy with God. Such things are important in bridging cultural barriers. The author helps break down another misconception of spirituality when he speaks of its communal aspects. Part of spiritual practice includes heavy doses of solitude, silence, and stillness, but this is not the whole picture, Holt says. Christian spirituality is “not only personal but communal,” he says on page 20. “The Bible does not know of separating individuals from the people of Israel or from the church; our relations with God are as members of a body, not as isolated individuals.” And this connects spirituality to corporate worship. The church began this way in its earliest years as it adapted Jewish synagogue worship to a Christian context. Worship was next exercised in small groups and eventually in large congregations. (26) Holt points out that corporate worship is the primary means of spirituality in the Anglican tradition. The importance of corporate worship is one of the ways in which Christian spirituality is differentiated from Hindu and Buddhist spirituality. One of the most helpful aspects of Holt’s text is his discussion of various metaphors of spirituality. It is impossible to delineate them all here, but he groups the metaphors in helpful patterns. For instance, the process of Christian living is illustrated by growth, unification, and healing, which all describe gradual changes. (125) Each conveys different nuances of Christian living, and they become even more powerful when considered together. Each stands alone, but each gives richer meaning to the spirituality behind Christian living. Holt has written a very assessable text both in length and complexity, or the lack thereof. It provides an introduction to the subject with all of the strengths and weaknesses normally associated with such types of literature. Since he is covering such a broad subject spanning millennia and continents, and he has done so in relatively few pages, the condensing is substantial. He gives more space to the more influential persons, while some persons or movements receive only a paragraph. This actually is a strength of the book because Holt provides some quick, helpful information on these figures. It can help direct a person’s further reading or provide a quick introduction to such reading. At the beginning of the book, Holt says, “Spirituality is easily misunderstood.” This is partly because it is a “transreligious” word not tied to a single faith. “Furthermore, ‘spirituality’ looks suspicious to some Christians because it sounds like ‘do-it-yourself’ salvation,” he says on page 2. Because it can be misunderstood but yet is an important part of Christian tradition from the earliest decades, it is important to understand spirituality. Holt’s survey can be part of that understanding. A reader likely will come away from the book no longer afraid of the term or its practice. Better yet, it can be hoped that the reader will come away with a growing desire to pursue varied spiritual practices in a way that honors Christ. Today’s North American culture has a high degree of openness to spirituality. It generally reflects a dissatisfaction with organized religion coupled with a sense that there is more to reality than can be comprehended through reason and the sciences. This presents an opportunity for those interested in pursuing the New Testament Great Commission of making disciples of Christ. When Christians realize that “organized” is not the most important adjective to modify the noun “religion,” that “spiritual” may be the most essential modifier, then the church of Jesus Christ may stand ready again to have a substantial impact not only on people’s spiritual lives but on their cultural lives, as well. Holt provides readers with a primer for such a change by helping the cognitive part of their minds to understand the tradition and present day reality of Christian spirituality. The other essential steps are for readers to actually experience such spirituality and then to let it affect how they live their lives. Walking under a canopy of oak and elm trees along a blacktop road, I found myself praying–literally verbal prayers spoken to the sky that peaked through the leaves. But the prayers were not really to the sky; they were to the divine beyond the sky. That is no simple thought; that is magnificence. Then another owl off to my right hooted back to the first. Wisdom not only speaks, wisdom hears. Sometimes it does not take much to be enough. Those of us who like to read are pulled along through many dull sentences and paragraphs in hopes of encounters with truly marvelous ones. The payoff is such that we keep pursuing. Today, at lunch, I discovered some special words from Thomas R. Kelly. They came from a lecture he gave at the Germantown Friends’ Meeting in Germany in January 1938. Kelly was a Quaker and a philosophy professor. His life showed that a person can allow his or her thoughts to dig deep, only there to find that the One who made the pursuit possible is the One to be worshipped. 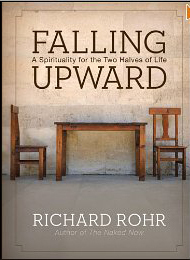 Last night, I started reading Richard Rohr’s new book, Falling Upward: A Spirituality for the Two Halves of Life, because I felt I needed a devotional boost. Got it. The phrase, “given a span of years to discover it,” is what captured me. Since I am now in the second half of life, this rings true. I do feel I’ve been discovering myself, my deepest identity, and it’s just now becoming clearer. Rohr does not, however, seem to leave any room for the nurture side of the nature-nurture equation. It seems obvious in life that we are shaped by both. I guess his point is that our deepest identity, our soul goes beyond both nature and nurture — that soul is before nature and nurture. Lord, help me to wake. Help me to grow my soul.